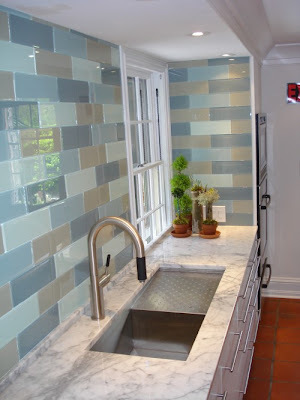 Take the back wall: The sink off-centered between two windows - although the faucet seems dead centre; the tiny backsplash that serves no purpose. But most egregious to me is that the windows are cut off a few inches from their base. This looks odd from the interior and will look even more bizarre from outside. Believe me, I know; I lived this in the original kitchen, it's why I fought the carpenter to get zero backsplash on the new sink wall and at least my windows were sealed units. Then there are the finishes. 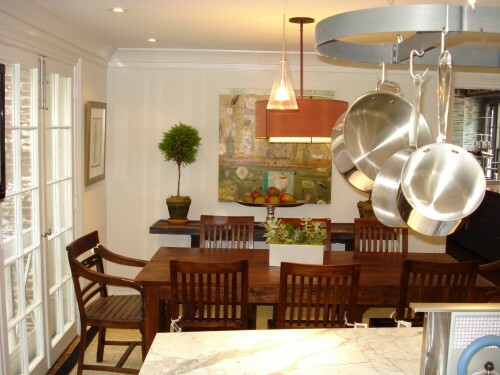 There is so much going on in this room: saltio floor, Calcutta Gold marble, glass tile backsplash, stainless steel, white and Anigre cabinetry, glass pendants, drum pendant, suspended pan rack and two kinds of wood furniture. 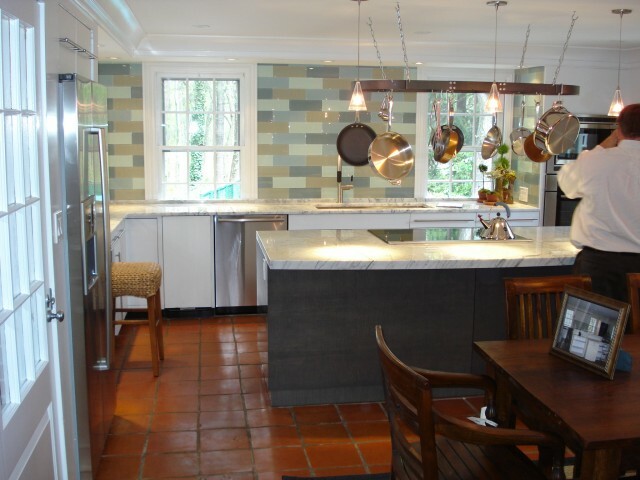 Contemporary/traditional, cool/warm, square/rounded - this kitchen doesn't know where it's going. Individually I love most of the fixtures and fittings but together it doesn't work for me. It's tagged as a Showhome Kitchen. Would you go for it? Umm - No. I agree, way too much going on. And the off center sink would drive me crazy everytime I walked into the room. I would worry about clunking my head on those pots. I agree on all points. Why wouldn't that sink have been centered. That alone would drive me mad.